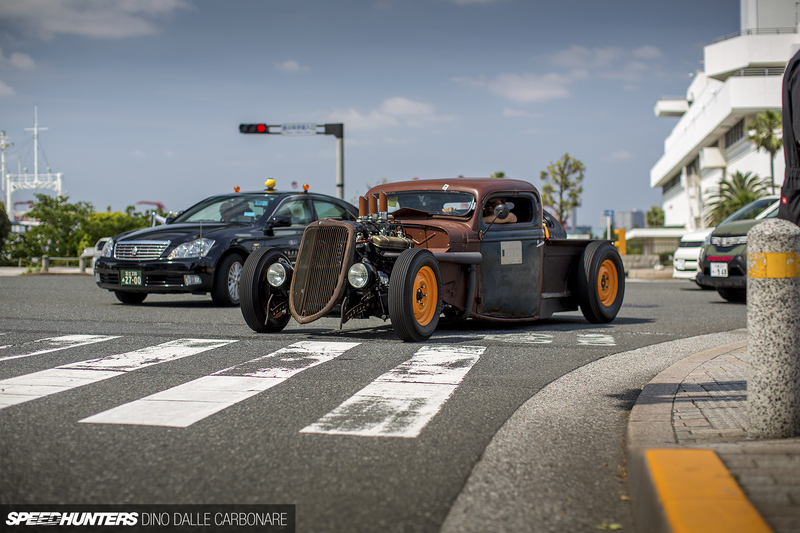 Once the weekend rolls around in Japan, it’s time to hang up the suits and pick up those leather jackets or overalls and get busy with car things. 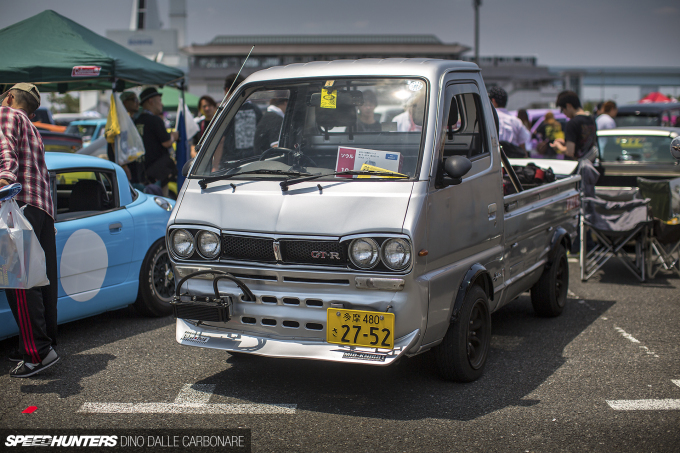 The weekend transformation of the average Japanese car guy is nowhere more apparent than in the custom scene; one that in the Kanto area is defined by Mooneyes. 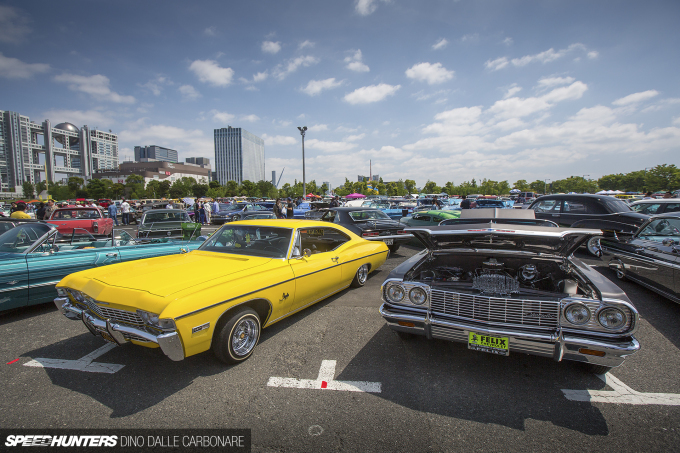 This is what Odaiba looked like at 8:00am; lines of custom cars in a procession that extended a few blocks, but took an hour or so to reach the gates. Seeing the cars parked up at the venue itself is cool and everything, but I much prefer spending time hanging around outside attempting to grab mood-setting images. 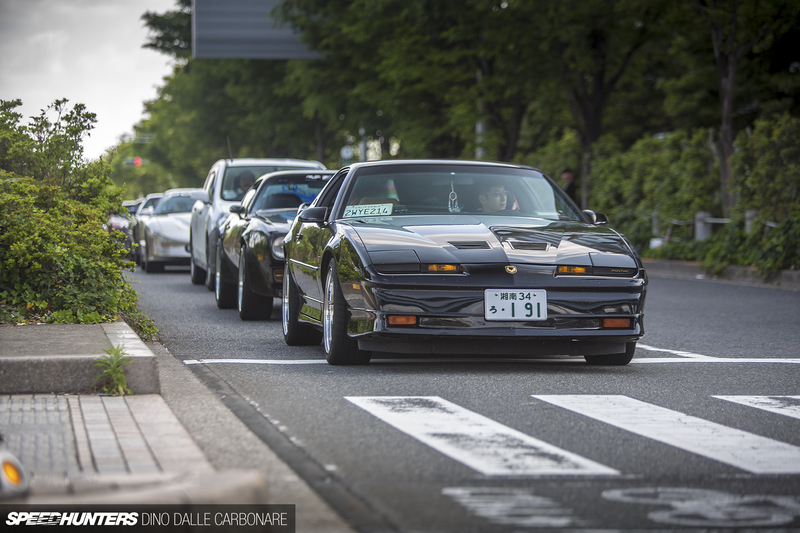 And with the variety you are subjected to in Japan, there is truly never a dull moment. You are continuously bombarded with the broadest line-up of awesomeness you could possibly imagine. So that’s exactly what I did for a couple of hours – hung around outside. 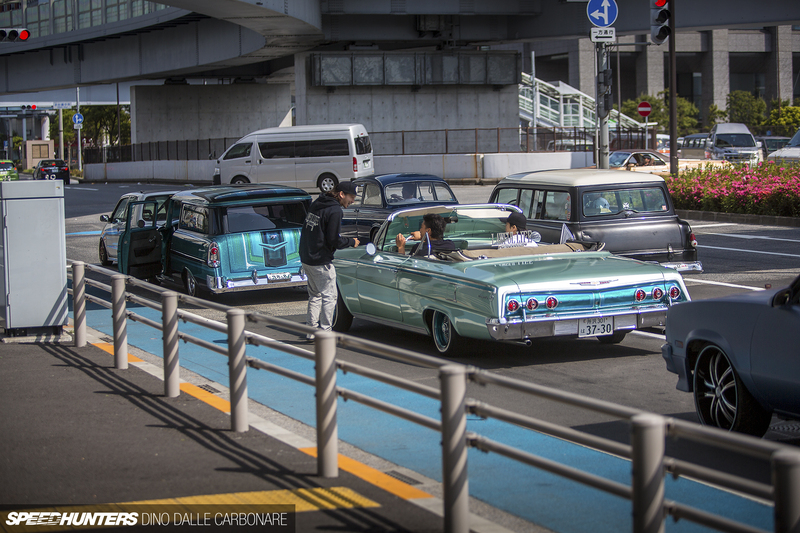 I was ready like a sniper with a precision rifle, but with my camera capturing moments in time; snaps of cars and people seemingly doing the most natural things, yet creating scenes you wouldn’t necessarily associate with Tokyo, or Japan for that matter. Car clubs were assembling curb-side and waiting for all members to arrive so they could convoy into the show or park up together. 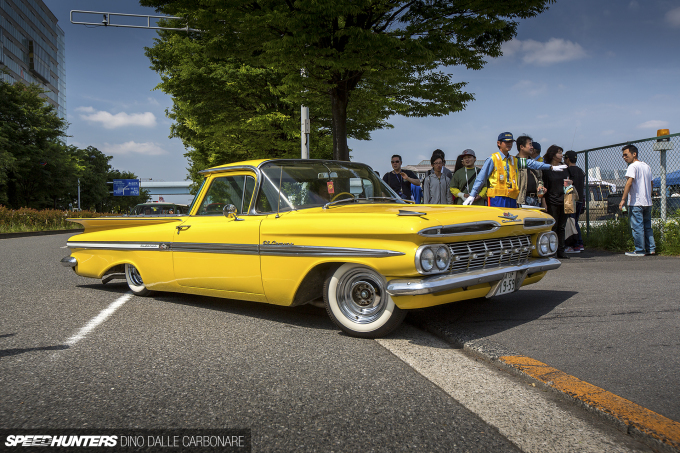 Events like these are a perfect opportunity to see old friends, catch up and talk cars, all while basking in the surreal atmosphere that Mooneyes manage to create. 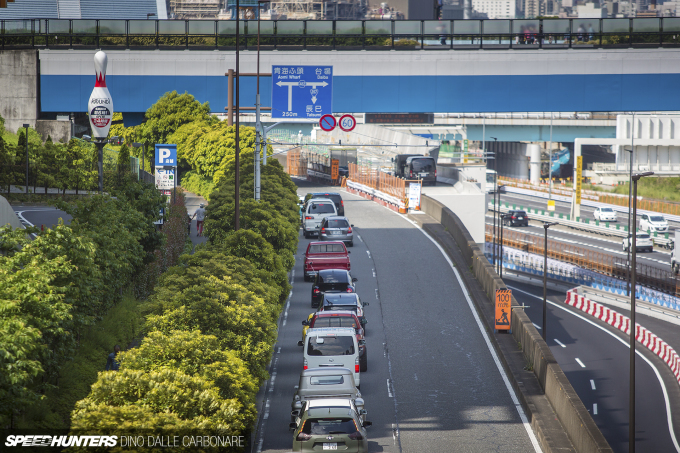 With 1200 cars expected, the flow of traffic coming around the last turn before the event gate was constant, mixing with regular Tokyo street traffic. I thought it was cool seeing this rat rod right alongside a Toyota Crown taxi. 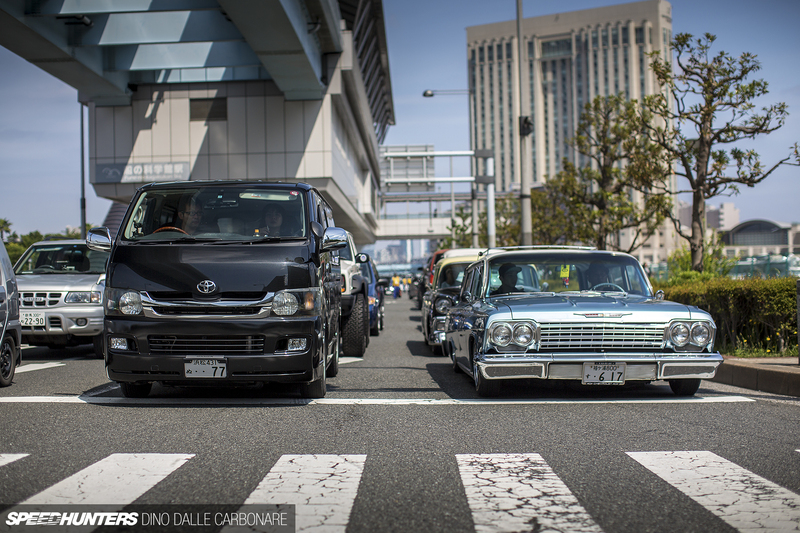 The Japanese are into pretty much everything, and I just love how, thanks to gatherings like these, they are able to allow so many styles to coexist alongside each other. Where else in the world would you see a custom Hiace next to an Impala wagon? 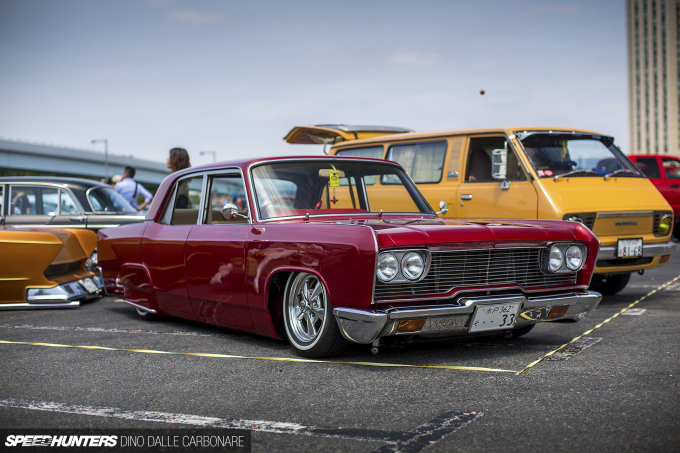 It’s not like I need to show you any more examples, but again, the lowrider guys prove that they do it so damn well – especially when it comes to Impalas. But what’s with yellow? It seems like it’s in fashion this year… If anything though, it certainly makes this particular coupé stand out from the crowd. The Aichi-ken-based Pharaohs are one of the oldest and most respected car clubs in Japan. 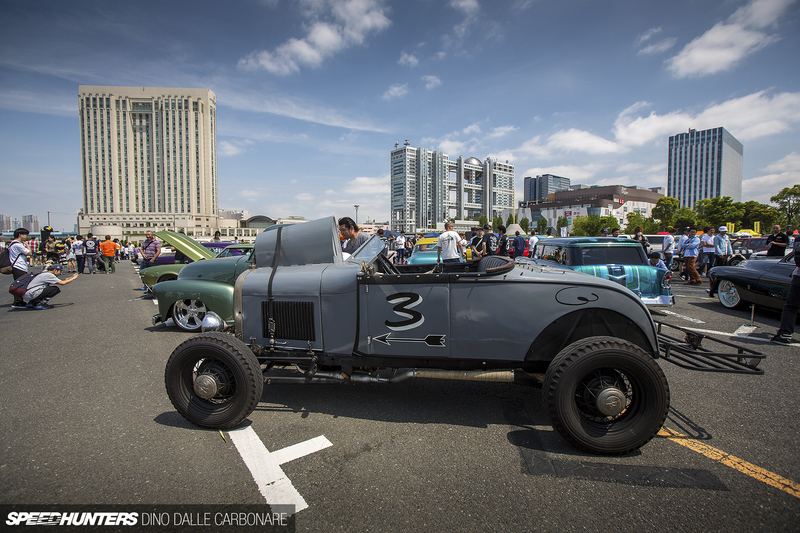 In fact, they’re as old as the Street Car Nationals show itself, and their cars simply ooze presence. Not too far away was this roof-chopped Crown pickup – definitely the most ‘out there’ take on this Japanese classic I’ve ever come across. Combining elements of both American and Japanese design, this generation of Crown in particular is so well suited to accepting the custom touch. 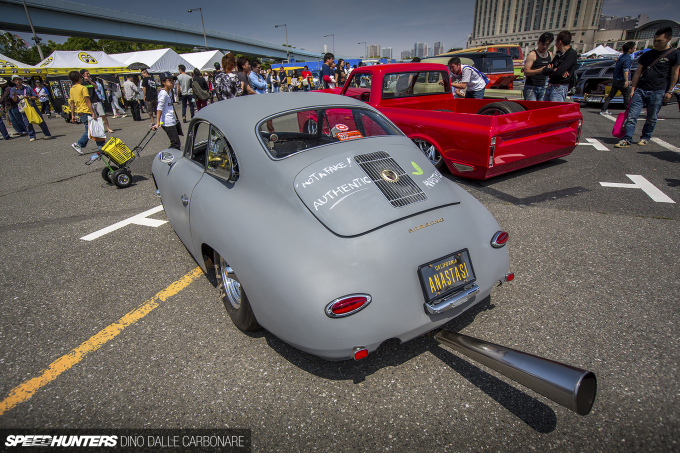 The Hiroshima-built Anastasi 356 that I spotlighted last year at the Track & Show event has been in a constant state of evolution. Aside from the massive drag tyre setup it’s now on, the old Porsche been fitted with a more powerful VW motor and a not-so-road-legal megaphone tail pipe. At a show like this, it’s easy to get lost in the details and forget to look up and take it all in as a whole. 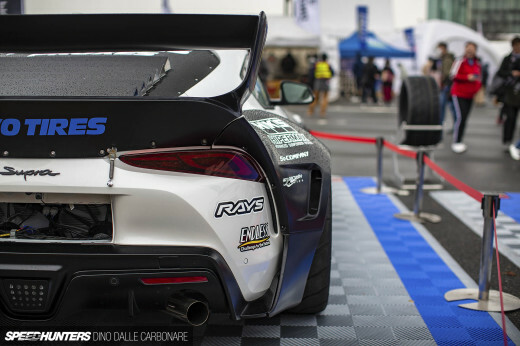 This venue, the same one use for the D1GP Odaiba round, has some really cool outlooks, including the Fuji TV building which really sets the mood, reminding you that you’re in one of the most advanced cities on the planet. It’s quite interesting to see how quickly the whole US-influenced off-road thing is picking up in Japan. It doesn’t matter if it’s rock crawlers with massive suspension articulation like you see here, or more Baja-oriented pickups – it’s all growing at an alarming rate. 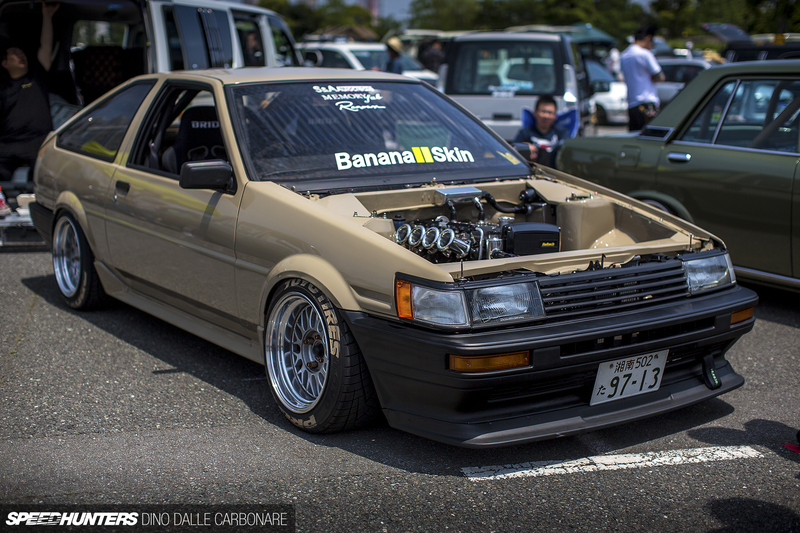 I just love how the Japanese keep moving forward and trying new things. I couldn’t possibly cover a Mooneyes show in Japan without including at least one image of a Mitsubishi Debonair. With all the talk of Mitsubishi in the news lately it really makes your wonder how a maker of some of the most unique cars ever to come out of Japan could have possibly gotten itself in the situation it’s in now. It’s as if it almost didn’t care any more. After checking out a pinstriping class last year at Art of Speed in Kuala Lumpur, I have the upmost respect for these artists. Aside from their steady hand and precision, I’m always surprised at how they nail symmetry. Crazy stuff! 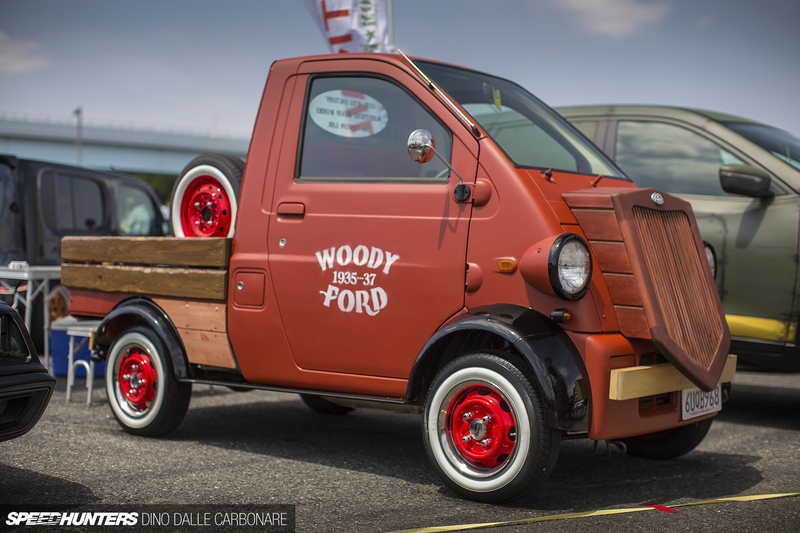 You may think that after seeing a woodie-style Daihatsu Midget, you’ve surely seen it all. And while this unequivocally-Japanese micro pickup is built with a very unique and cool theme in mind, I came across another one that tops it. In fact, it’s so crazy that I’m keeping it for a spotlight, so make sure you don’t miss that! As far as roof chops go, this one is pretty damn low! 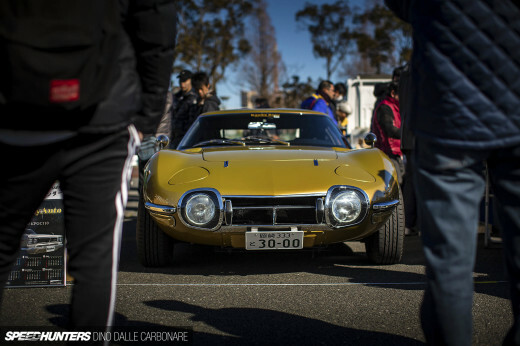 The more modern Japanese component of the Street Car Nationals is one that has been truly embraced in recent years. 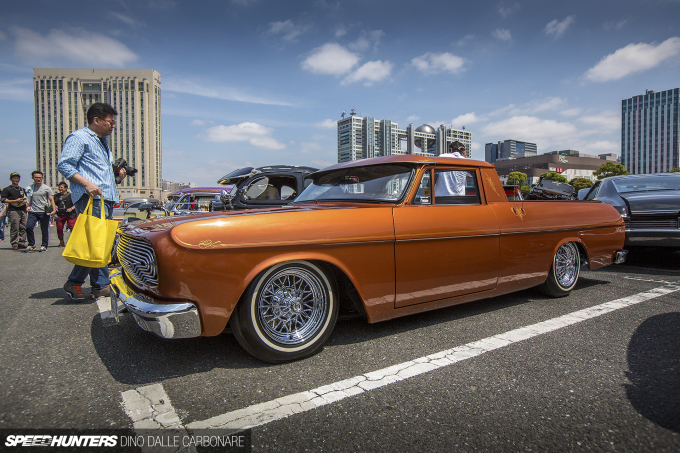 Mooneyes recognizes the relevance of it all and allocated space for some of the best cars in the scene. This EK Civic coupé epitomizes the Japanese take on the US show car scene; a fine balance between presentation and performance. With the younger generation struggling to find much interest in cars these days, scenes like this always put a smile on my face and give me a little hope for the future. Granted that there are a ton of other tech-based ways that kids can have fun and find an interest today, the unique experience that tinkering on cars and driving them offers will hopefully still entice the adults of tomorrow to aspire to owning something cool in the future. 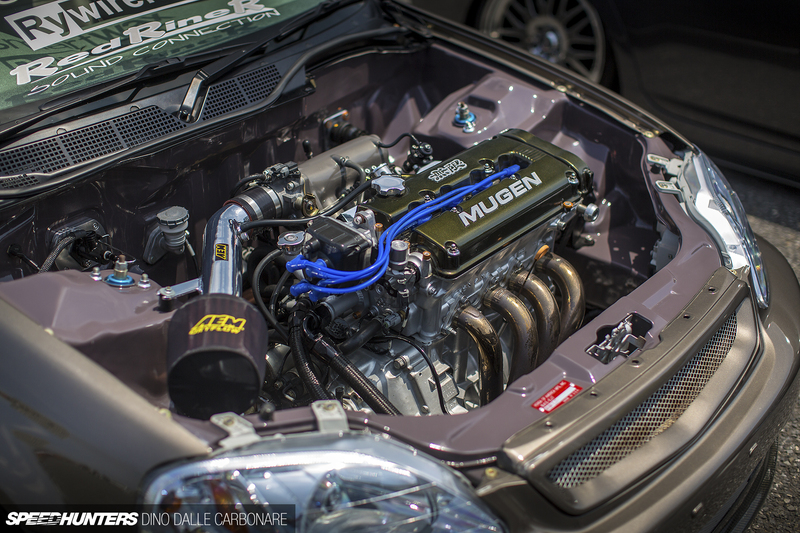 It’s down to manufacturers too; if they make interesting cars even kids will take notice. 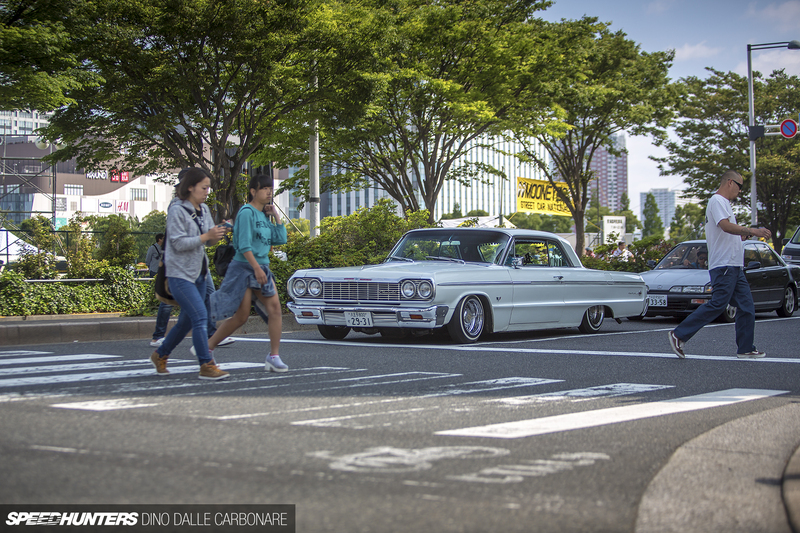 The Yoneijee-kurabu never misses a show; they are always out there representing their group and the shops like N-Style that have paid such a big part in getting their cars looking and performing as they do. Hako-kei-tora anyone? 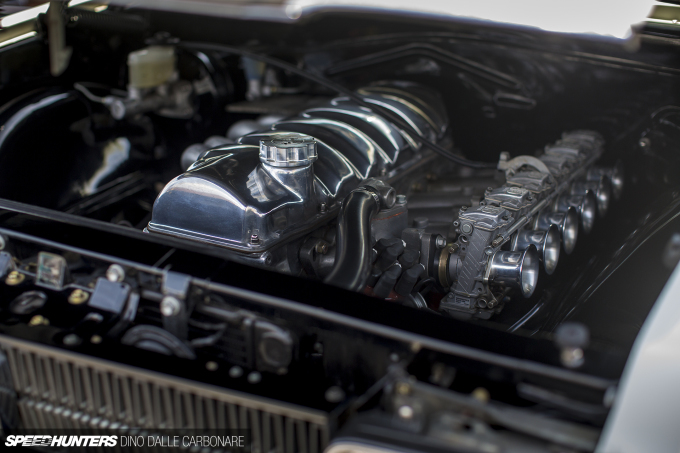 I wonder if you can fit an S20 engine in there somewhere? 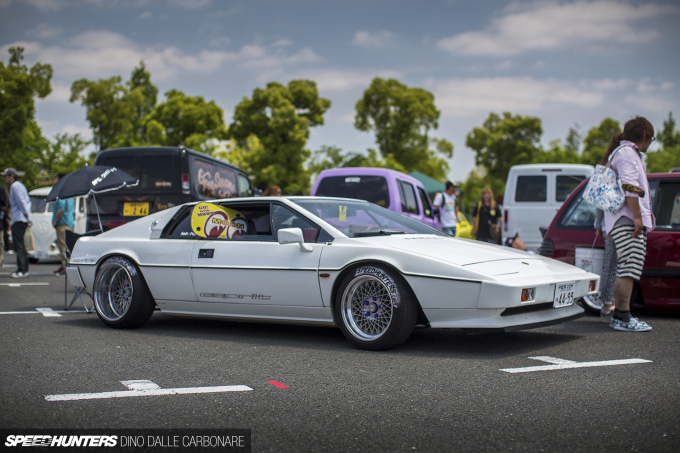 Take a look at this Lotus Esprit rocking some DIY Speedhunters tyre bombings. I had a brief chat with the owner while handing him a few of our latest stickers, and he told me he religiously checks the site every day. Big up! The 1969 MS51 Crown coupé proves that Toyota has been doing cool stuff for many years. And the best thing is to see how people refine and modify these classics to make them stand out. I really liked the simple approach on the exterior, but what made this car even cooler was the original M-type motor breathing through Keihin FCR carbs under the hood. This thing must sound nuts! 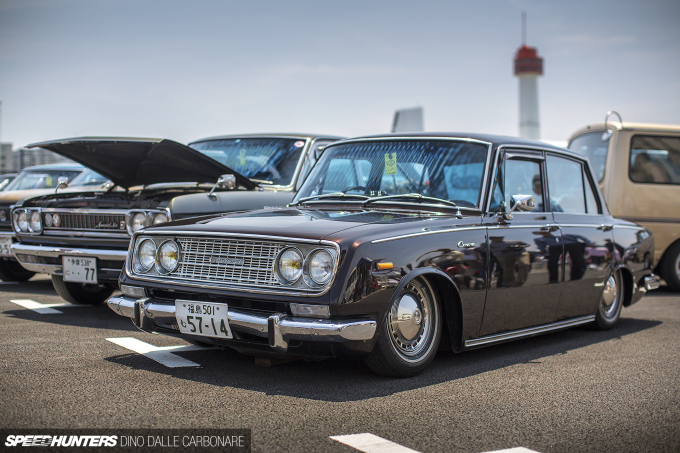 And simple is often the best, as this old Toyopet Corona demonstrates. A static drop and modern respray is sometimes all that’s required. S&A Auto Create is always on-point with its projects, and this khaki AE86 is just another example of how the Kanagawa-based shop is single-handedly helping evolve the Japanese tuning scene through amazing attention to detail. 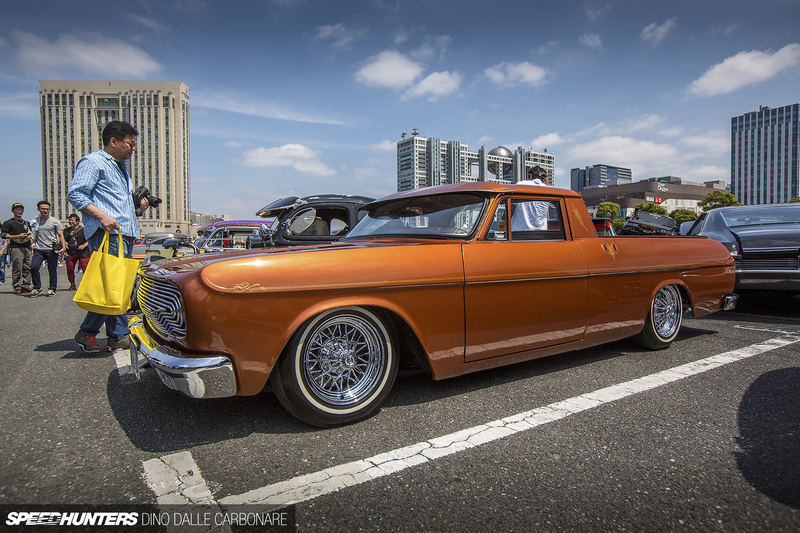 Before we head into a bunch of spotlights from the 2016 Mooneyes Street Car Nationals, here’s an image of the car that made me think the most. As a purist, it’s hard to see such a focused driver’s machine like the original NSX give up its driving dynamics in favour of stance, but it is nonetheless a beautifully executed project. But where you stand on this is what I’d like to hear. 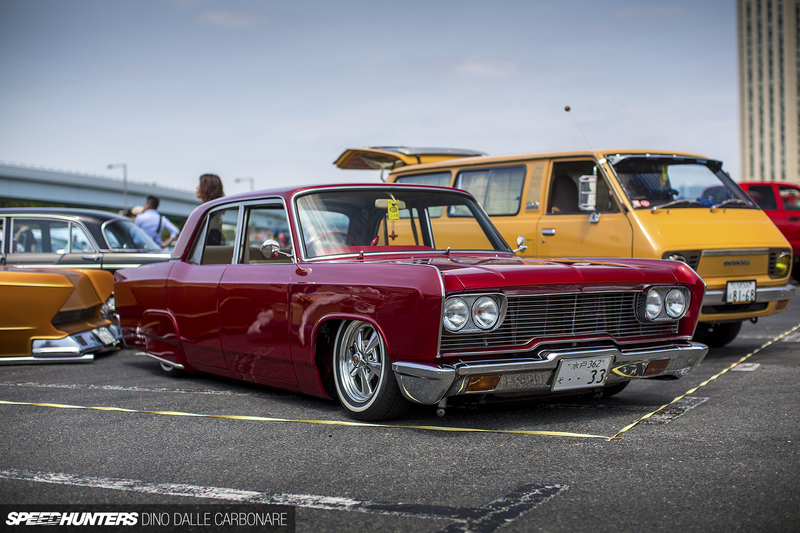 When is low too low? That Hako kei tora is rad! Thanks for the coverage Dino! Never such thing as too low. So many cars that i'd never want to own make me look twice when slammed. Never too low. I'd like more coverage of the USDM showcar scene. 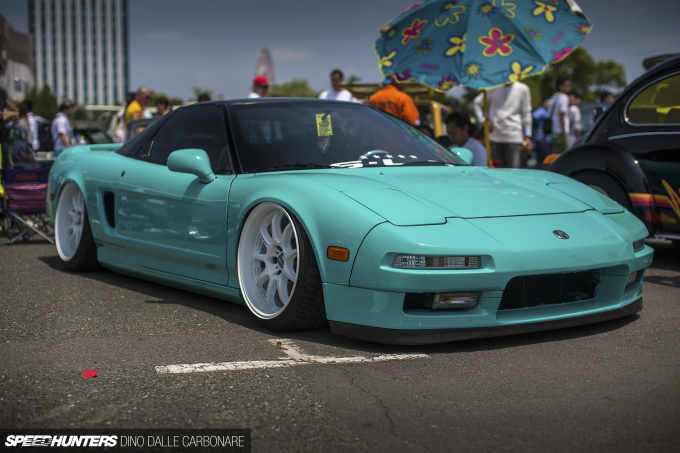 @joshg51 Low is good yes, but you can't really expect and NSX to handle any more after a lowering like that can you? Tire bombing....backwards. Watch it catch on now, haha. 11:35 pmMay 15, 2016 FuelEconomyKilledTheCarsWeLove! NSX is too damn low! For shame! 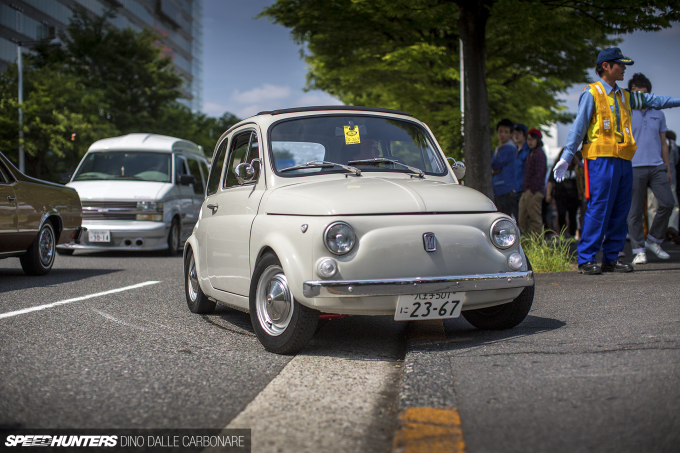 That fiat 500 is done right. love it! 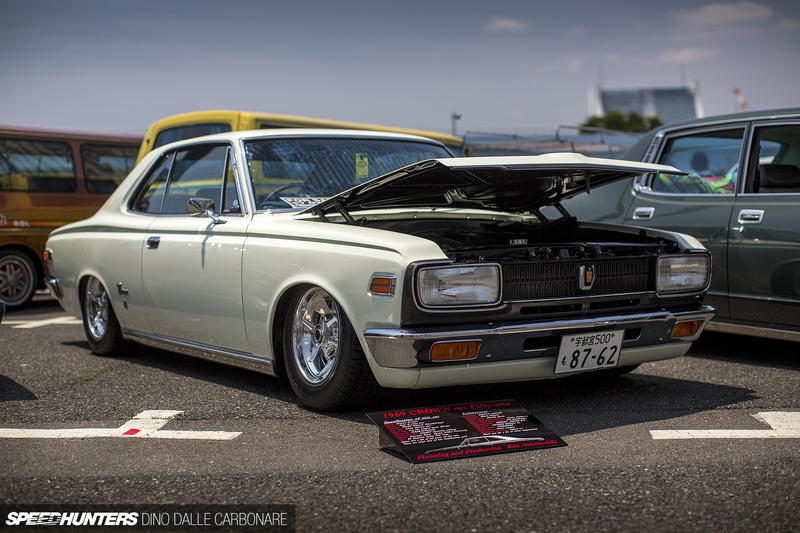 speedhunters_dino Just an FYI, that Toyopet "crown" is actually an RT40 Corona. 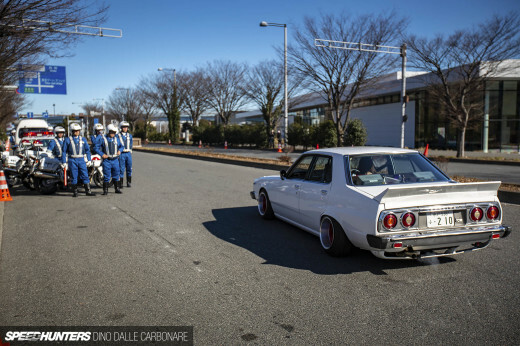 speedhunters_dino Please, PLEASE tell me how I can find out about these events BEFORE they happen. I've lived in the Tokyo area for half a year. and besides TMS I've not been to a single automotive event. Thank you so much! speedhunters_dino I think modern airbags don't handle too badly if they're good quality. 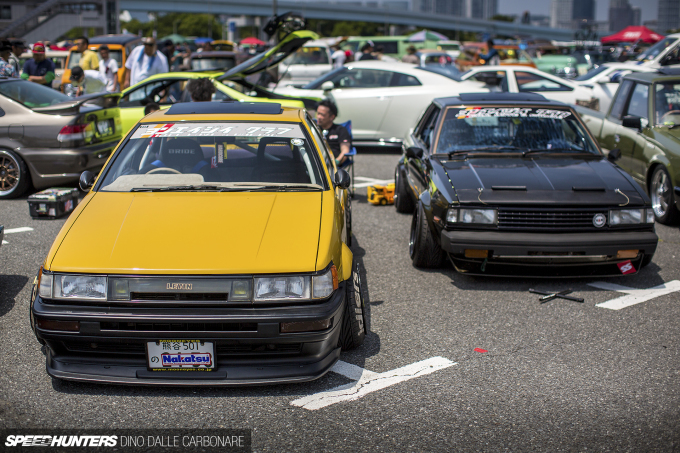 These are the articles I check speedhunters for. when camber goes beyond 3 degrees that's killing the car. Great writeup as always! Paolo Siega Yeah agree, and thanks! Frozzy Big time, in fact it's pretty obvious that's what they wanted to aspire to. There was another one at the show that had the rear doors converted to suicide ones, couldn't get a picture though as it had all these poles and fences around. Obviously the owner didn't want people to get too close. Too bad! 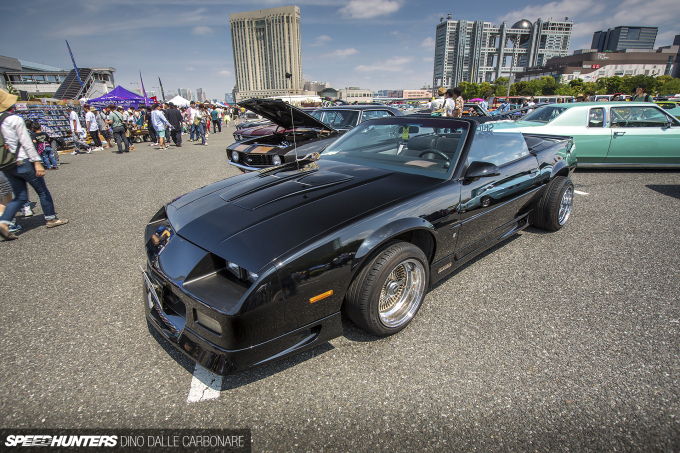 The Camaro wears a totally authentic late 80's - early 90's euro lowrider look, i, for one, am loving it. I may be the only one perhaps, but it's still history! Can there be any doubt that many Japanese love American car culture? The reverse is true as well, but I have never seen such diversity of taste in any single American group. 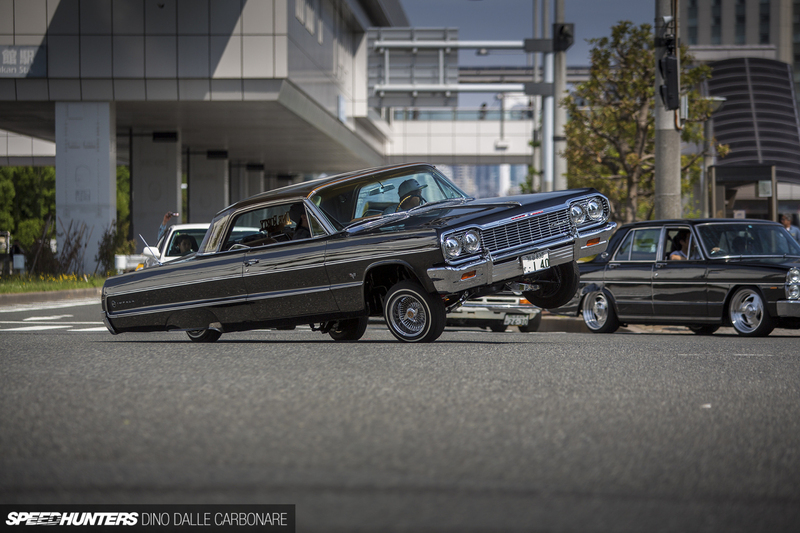 When I saw the Impala on hydraulics was in Odaiba, I almost fell out of my chair! 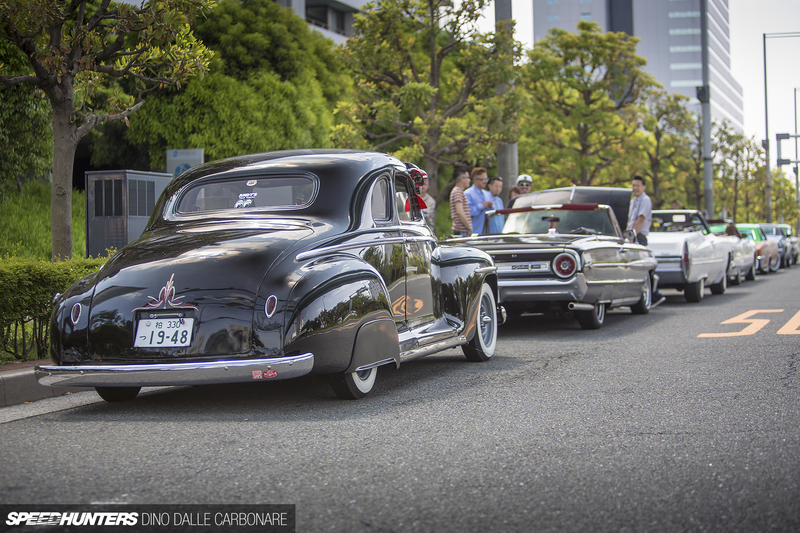 Are there any car shows or meets in tokyo area this weekend, here from okinawa? 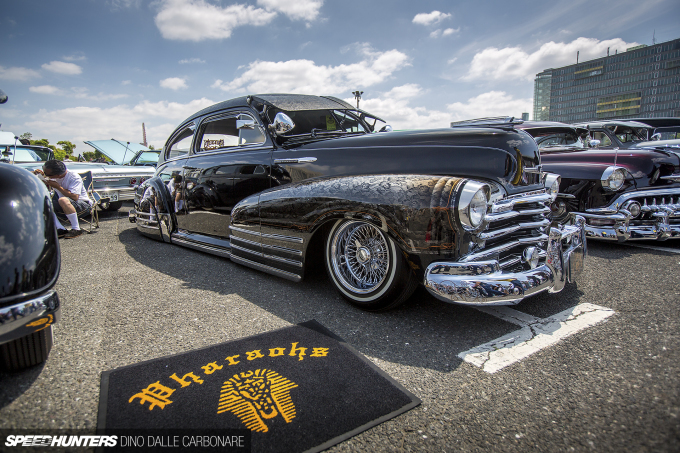 Weren't The Pharaohs the gang from "American Graffiti?" If the streets were as smooth as glass, there would be no such thing as too low. I'd say as long as you can drive your car without destroying it, it's all good. 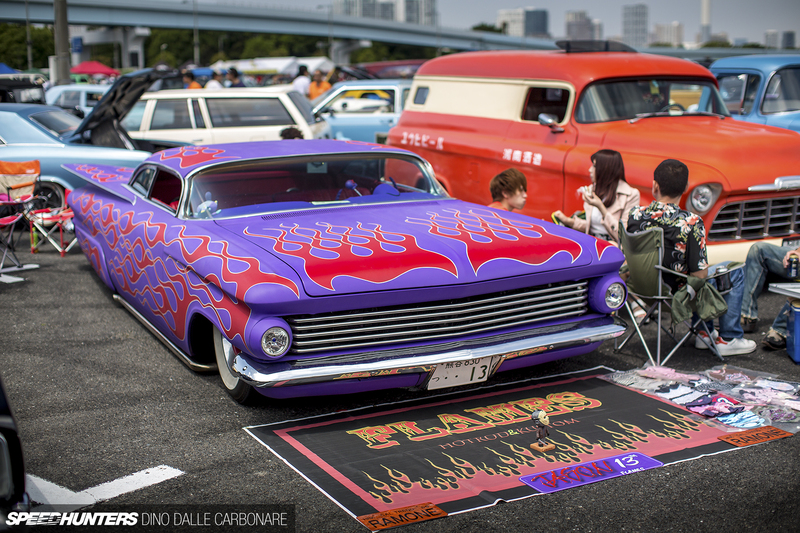 Great post, I love seeing American hot-rod culture embraced in Japan. Holy mother Lowrider.Actually I love JDM more,such as STI.U konw waht?Cuz lowrider is illegal here.